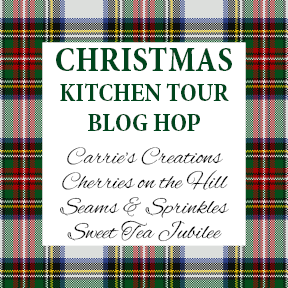 Christmas Kitchen Tour Blog Hop! Happy holidays dear friends, both old and new! I am so excited to be celebrating with you by sharing the new additions around my kitchen for today's Christmas Kitchen Tour Blog Hop. Grab your jingleiest bells and let's get to dashing through the tour, shall we? The first area on the tour is my dining room, lucky for me my modern rustic style fits in perfectly with the holiday dashes of panache! I added red, green and gold plaid place mats and napkins. To make the napkins even more charming for Santa, I grabbed an 8 pack of wired bows from the dollar store with little bells to wrap around each one. It is such an affordable way to enhance the decor and even reusable for each year to make new memories with! My centerpieces are a beautiful bouquet of flowers that I added a mini stocking to, flameless candles and alternating red and gold round ornaments. These flameless candles are one of the most amazing house items I have. They add a great charm and relaxation to any event. If you have nothing on your holiday wishlist yet, do yourself a favor and ask for a set from Santa. Around the kitchen I have added in multicolored round ornaments in several glass pieces I have. These are slowly losing space on my tree each year as we get more and more personalized ornament gifts and this gives those old ornaments a new life and purpose! It really brightens the area up and adds extra cheer while I am working around the clock these holidays. They also pair wonderfully with my multicolored gingerbread house. I don't know about you, but I adore this nostalgic activity every year and I am so fortunate my husband had enough patience to sit with me so we could do it together! Next, I want to swing over to my most favorite newly updated area of my kitchen- the hot cocoa corner! I have finally changed up my chalkboard wall for the holidays and it has become the highlight of my holiday events, I think I should just bring in my pillow and blanket and camp out here! I also added a short icicle lights that creates a perfect outlining border for the writing- I just love when this stuff comes together! I have all the essentials stocked to build the most delicious and epic of hot cocoas ever: mini marshmallows, peppermint marshmallows, candy canes, dulce de leche, homemade salted caramel sauce, salty sugar crystals, chocolate flakes, whipped cream and holiday paper straws. 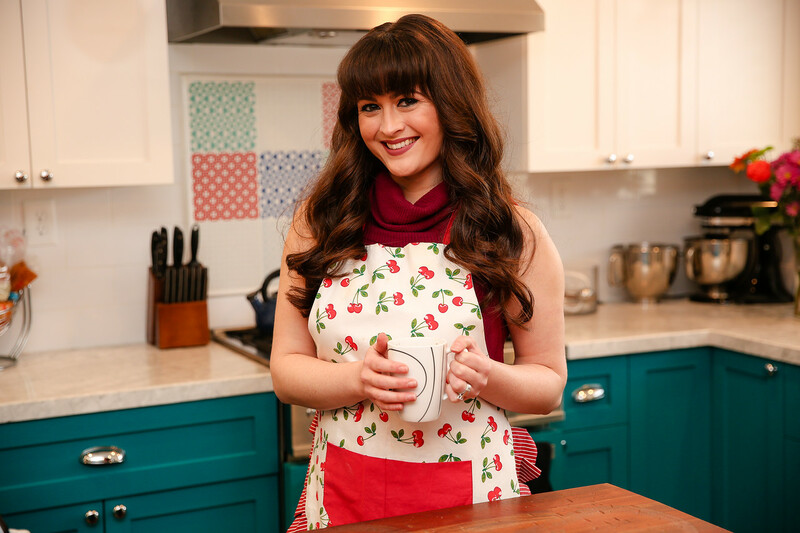 Give your guests options for their concoctions (see what I did there ;)) To make the most delicious crock-pot hot cocoa ever follow the simple steps below. Mix all ingredients in the crock-pot slowly until combined (it will be chunky still). Cover the crock-pot with the lid and cook on high for two hours. After two hours, remove the lid and mix well. Turn to the warm setting and serve all your guests a fresh cup at the cocoa bar to add all their favorite toppings! My last stop on my kitchen tour is my trusty oven, Betty. It is the epicenter of my being and the thing that has kept me trying new things and being braver by the day to venture out more and also invite more people in to share the fruits of my labor of love with me. My darling husband got me these festive decorative towels that remind me to smile the whole time I am working away like a busy bee with Betty all over the kitchen during my holiday peak season! I hope you enjoyed seeing my little holiday cheery editions during this edition of the Christmas Kitchen Tour Blog Hop! Be sure to make a few more pit stops to catch the other ladies on the tour today for more rocking around the clock to get your Santa hat filled with even more inspiration: Carrie of Carrie's Creations, Heather of Sweet Tea Jubilee and Claire of Cherries on the Hill! I wish you every happiness this holiday season and look forward to sharing a wonderful 2016 with you! Thank you! Hope you enjoy it as much as we did! Your hot cocoa bar looks amazing! I love the chalkboard sign with the little lights- such a fun and festive little touch! Thank you! It's my first year doing it so looking forward to making it better and better each time!